The Calico Cat: Bringing an old project back into focus. Bringing an old project back into focus. Bringing an old project back into focus., a photo by aviva_hadas (Amy) on Flickr. This project already has a long story. Not unlike now, when I started quilting, paper piecing was all the rage, or at the very least popular. I tried it & decided that it was not for me. Fast forward several years & this paper piecing block is very popular. I succumb to the temptation & instead of making myself several blocks, I made blocks for a swap. Yes, you read that right, I signed up to make blocks using a technique that I do not care for at all for other people. So I had a couple/few from the swap & a few that I made for myself. Not enough to make a useful quilt. Enter plan B, hire someone to piece some blocks. I provided the fabric, so that they would "go" & so that they would fit my vision. My goal was 20 blocks, (I don't really make small quilts.) well one thing led to another & my piecers desire to have some cash did not out weigh her desire to work on her own stuff (& life just got in the way). No big deal, no hard feelings, etc. Luckily I have 12 blocks. 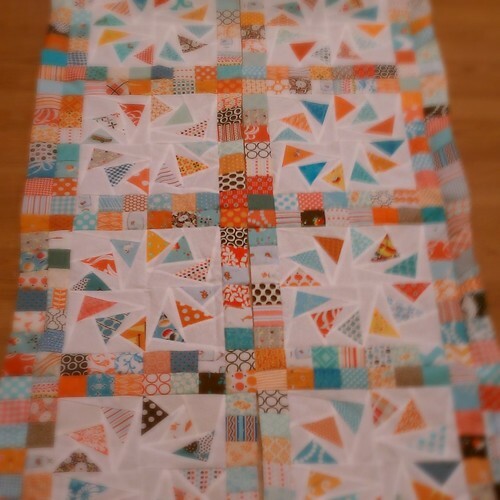 12 blocks will make a nice sized lap quilt. So I am in the process of taking these 2 rows & adding the last row & then will make a decision about whether or not to add another round or 2 of squares to the outside. I have to tell you Amy that I love the colors in these blocks even though I would probably never have chosen them. But that color scheme just works great. I think you sent me a link to that paper piece pattern. I really need to dig it out and try it. Can't wait to see if you add borders!! I have made just one of these blocks (which I love) and it took forever. I don't know what you were thinking about making a large quilt of them. I think your 12 blocks with some other "stuff" around them will be great!